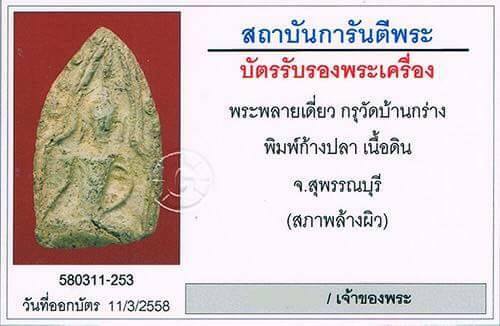 Phra Phrom Luang Phor Doo Wat Sakae BE2522. Nur Loha Pasom, with 2 codes. It comes with Uamulet certificate for authenticity. It won No4 Placing in Thailand Khon Kaen Grand Amulet Competition on 24th July 2016. Attached with Gold Waterproof casing. Luang Phor Sorthon Wat Sorthon BE2508. It comes with Uamulet Authentic Certificate. Attached with Silver Waterproof casing. Roopmuen Roon Farpa Luang Phor Phrom Wat Chongkae BE2512. 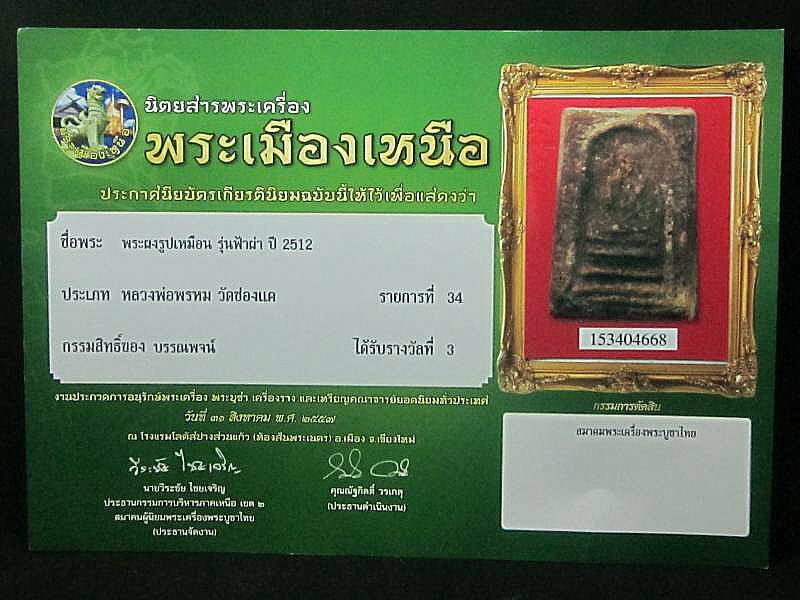 It won No3 Placing in Thailand Chiangmai Grand Amulet Competittion on 31st August 2014. Attached with Silver waterproof casing. This amulet mixed with lots of holy material. When the amulet is ready, one of Luang Phor Phrom’s disciple put in his pocket and continue to do temple job. Suddenly he was strike by lightening and fainted. Other disciples carry him into the temple but his clothe was in good condition. When Luang Phor Phrom arrived and sprays holy water on him, he wake up and do not injure. First Batch Roopmuen Lang Paya Dtao Luang Phor Liew Wat RaiTangThong BE2534. Nur Phong Chanmak. It comes with original temple box. 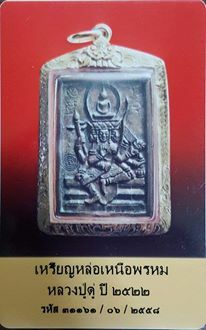 Khunpaen Kru Wat Bang Krang. Phra Phlai Deiw Phim Kang Pla (Fishbone). More than 400 years. It comes with G Pra certificate for authenticity. Attached with Gold waterproof casing. Salika Kruba Baeng Wat Bang Tanood BE2555. Nur Phong with ruby. Inserted with Kruba Baeng’s hair in plastic casing. Rooplor 80th Birthday Phor Than Daeng Wat Phikulthong BE2534. Lop Om Luang Phor Parn Wat Bangnomkho BE2451. Rare in market. Material mixed with magical herbs, kesorn, holy powder from past gurus, 5 great powders (Phong Putthakhun, Itichy, Tri-singhe, Maharaj, Putthamang) which same as material used by Somdej Archan Toh, Somdej Pilan & Somdej Luang Phor Phoo Wat Inn. It entered Thailand ChaengWattana Grand Amulet Competition on 8th May 2016. Somdej Prok Pho Lang KhawSarnDam, Luang Phor Toh Wat Praduchimplee BE2516. Made 7500 pieces only. It won No1 Placing in Thailand Phitsanulok Amulet Competition on 17th July 2016. Attached with Silver Longya Waterproof casing. First Batch Salika Kruba Baeng Wat Bang Tanood BE2537. Nur wahn. Inserted with Kruba Baeng’s hair in plastic casing. Rian Rakang Luang Phor Phrom Wat Chongkae BE2513. Nur Alpaka. Very good condition. Sivali Phim Siliam Luang Phor Toh Wat Praduchimplee BE2521. Nur Phong Kesorn with takrut, made 4099 pieces only. Very nice condition. It won No3 Placing in Thailand Chonburi Grand Amulet Competition on 24th April 2016.